I recently met a new blogger, she dropped a comment on one of my older posts where I uploaded a photoshopped image of my cat Shyna. She told me that she would like to draw one of my cat photos, and I told her that I would be happy if she can get inspired by one of my photos, and that I would be very curious about the result. Most of the time, if I am not too busy, I visit the blogs of people who comment here, and that is basically how I learned about Laura from Create Art Everyday. I am not an illustrator, but I like to take a look at images, whether it is photography, all the other kinds of digital art, and also the classic pen and paper art. What I found on her blog was impressive, she is drawing a lot, and she is drawing very good. I’d like to suggest you to take a look and check out her blog Create Art Everyday, her work is really awesome! I clicked like on her most recent work, and I had to subscribe instantly, because I really love what she is doing. Then I got the email notification of her freshly published post, and as implied in the comments in one of my posts, she really has drawn my cat, inspired by this photo. 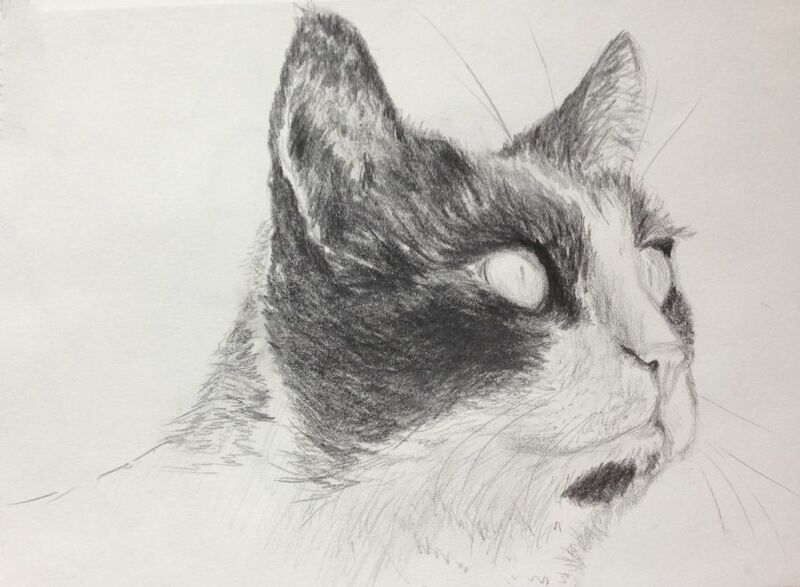 I was impressed, and very happy that there is now a drawn image of my cat Shyna, and I like how it turned out, but she told me that it’s a preliminary sketch, but that she is happy that I appreciate her work. I noticed that drawing and photography have a lot of things in common, take for example the fact that I upload tons of photos to my blog in a year, it’s not meant to tell you that they are perfect images, the only reason why I do it, is that I want to document my progress and things that happen around me, and I want to be able to take a look back, I want to practice and improve on my past work. What I would call a snapshot in my field, is something she calls a sketch in her field. However, even if she mentioned it was done in her humble sketchbook with bad paper, and in a short time, I must say I totally love the result anyway! If you like her sketch too, please visit her blog, and by the way, she is chatty too and replies to all comments like I do! It’s amazing the way she captured the beauty of Shyna’s eyes in a sketch! I am in awe of people who can sketch like that. Oh yes Trisha, I would like to be able to sketch too, but it would be another difficult to learn hobby, and I have a bucket full of them 🙂 I do agree, I pretty much love the sketch. Thank you so much, Trisha! I couldn’t draw in August of ’14, so I am a big believer that drawing is like anything else, you simply have to practice. I’ve been drawing daily since May or June of this past year, and it has made all the difference. I hope you try it. I used to be in awe of people like that too, and I am still in awe of people like that – because I always see so much room to improve my work. I think that comes with the territory. But there are some amazing artists out there. Really stunning stuff. Thank you again for your kind comments here and on my blog as well. Yes, I am glad I found her blog, she has a lot of beautiful drawings. Have a nice weekend Nia! Thank you kindly, Nia, both for your comment here and at my blog, too. It means a lot, truly. I hope you have a fabulous weekend! It is a great sketch of Shyna, she has caught the expression. I can’t draw at all but my sister does, she’s teaching herself to paint from lessons on a DVD so we find we can talk about composition, perspective and other things that our two hobbies have in common. Thank you so much, Taswegian. You all honor me with your kind words about my work. I hope you have a terrific weekend ahead! Laura is the sweetest – and so talented! So are you, Jodi, you sweet thing! I’m so glad you came over here to check out Dennis’s work. Dennis – Jodi is an artist and photographer and a stunning decorator and cook too! There is nothing this lady can’t do! I’m so glad to “introduce” you two! Dennis, her recipes will knock your socks off. Seriously, she is very good at so many things and is a kind human being as well. 🙂 I’m so glad you’ll be visiting her place! Dennis, you are so kind to share my artwork here at your lovely blog. I am so glad that you’re pleased with the sketch. I hope you’ll enjoy future ones as much! Thank you again for your help, encouragement and kindness. I hope you have a lovely weekend. I give all this back Laura, I am thankful too, thanks for featuring my cat on your blog with the wonderful sketch, and thanks for the mentioning too! I am very curious about your next work, also your work that is not related to Shyna. 🙂 Please enjoy your weekend too! Thank you again, Dennis. I am posting a portrait tomorrow, and usually I put them up for guessing and people can throw out names (or not) as they like. I hold all comments in moderation so that anyone who wants to guess won’t be “spoiled”. So if you’re interested in portraits of people, you’ll see one tomorrow if you stop by. I’ll be very curiously following your work as well. Take care and have fun! Very nice sketch! I will have to take a run over to Laura’s place and check out the rest of her work. It seems she is not very active anymore since her last post was sometime in 2016. It’s sad, because I liked to take a look at all her cool sketches. But you can still take a look, she uploaded quite some cool sketches. I hope she becomes active again at some point, but I know, real life keeps us all busy sometimes. I noticed that her last post was two years ago. I think all bloggers know how life can get in the way of writing. Hopefully, it doesn’t get in the way of her art work.